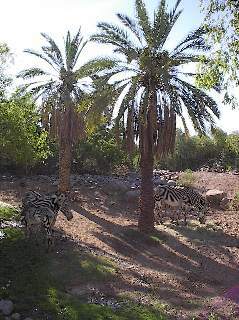 The Phoenix Zoo is a “must-see” attraction for families and especially kids. When you think of a zoo, what pictures come to your mind? 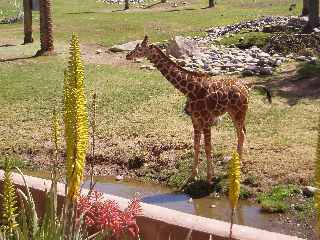 Can you imagine a zoo in the middle of the Arizona desert? It works! Even in the summer with the steamy jungle settings. Or in the winter with terrific light displays like Zoo Lights! It’s like an oasis in the desert complete with ponds, streams, water geysers for kids to play in, palm trees, and a misty steaming bamboo rainforest called the Forest of Uco! There are over a thousand animals! Zebras hiding, can you see one? As soon as you get out of the car the excitement begins. As you walk into the zoo you cross a bridge over a moat with floating logs. Look down carefully and you will see lazy sun-basking turtles (in the warmer months.) It’s fun to watch a turtle crawl up on a floating log and see the chaos that happens when other turtles get dunked into the lake. Then once you cross the entrance area you can decide where to start your adventure. 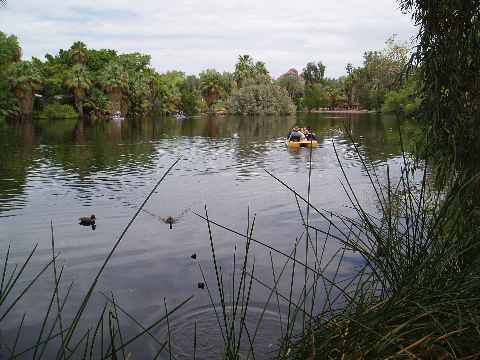 Do you like the desert trail called the Arizona Trail through the bird sanctuary, or the lush Tropics? There is also an Africa trail with lions and zebras and finally the Children’s Trail. Kids love the petting zoo and exploring the area called Harmony Farm. This is part of the Children’s Trail on the west side of the zoo. The Forest of Uco near there has a steaming lush bamboo rain forest. You will love the one mile walk around the forest anytime of the year. In the summer the misters make it very comfortable. There are cute small real bears artfully kept behind the inside of the walk. One of the latest additions is the walk through exhibit called Monkey Village. You go through a double gate so the critters can’t escape and then walk down a trail where you can see these agile monkeys right up close. Then the central lake is as picturesque as you will find anywhere in the desert. Great for a rest stop or photo point. You can rent various paddle boats too. Take a tram tour if you want to see a quick overview of the zoo. If you walk it you can spend hours looking at the sights! Best bet for admission is the year pass where your contribution supports this zoo. The year pass pays for itself in a few visits! And you help fund this great non-profit organization. In the fall be sure to check out Boo! at the Zoo around Halloween and then Zoolights! The zoo opens in the dark and the lighting is fabulous! Another must see experience! 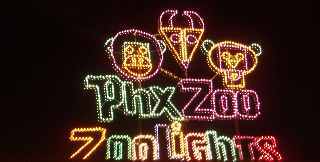 Where can I get more info about the Phoenix Zoo? Watch out for traffic jams. There are "special events" in Tempe when the southern entrance to the Zoo is totally blocked. The south entrance is N Mill and Priest. If you see a mob from the freeway then you will have to go to the northern entrance via McDowell and the Galvin Parkway (click on the "+" below a few times and you can see).